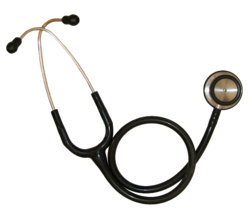 Leading Wholesale Trader of stethoscope from Mumbai. We are engaged in offering a wide range of Stethoscope, that is used for listening to Heartbeats, Lung and Blood Pressure Sounds. These are manufactured using quality basic material and are appreciated for accurate readings and reliable performance. Sourced from reliable manufacturers of the industry, our clients can buy these products at market leading prices. Professional Sprague Rappaport Stethoscope in Original Box Packing. Dual Head (Deluxe), Multi Pupose Sprague Rappaport, Type Single Head (Cardio Type), Cardiology Adult/Paediatric (LittmannType). Single Head Dual Head Paediatric Dual Head Single Tube Teaching Stethoscope (Double Tube). Stethoscope Arena USA Make - (All Stethoscope with Dual Head). Cardiophone S.S., Classic, Classic Life, Peadiaphone, Classic Mastero, Classic Royal SS, Peadiaphone SS, Ri-Rap, Nurseoscope, Basica Regular, Basic Deluxe, Peadiaphone. Spare Diaphragm Rim Set, Binaurals with Frame and Ear Tips.